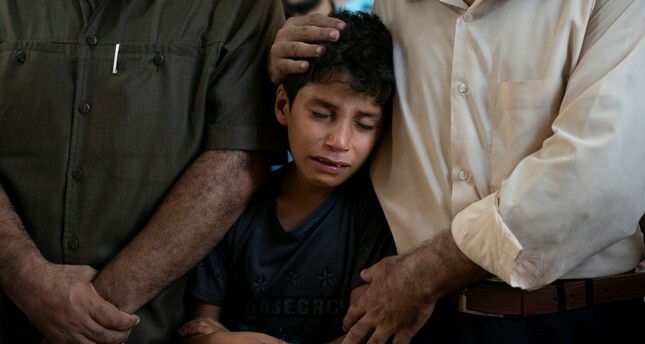 Hundreds of Palestinians attended Saturday the funeral of a 12-year-old boy killed by Israeli army fire during clashes on the Gaza border. Shadi Abdel Aal was fatally wounded Friday during demonstrations east of Jabalia in northern Gaza, becoming one of the youngest Palestinians to be killed in months of unrest along the frontier. One Israeli soldier has been shot dead by a sniper. Israel accuses the Gaza Strip's rulers of Hamas of orchestrating the protests and says it is merely protecting its border. The Jewish state maintains a crippling blockade on Gaza which it says is necessary to isolate Hamas, with whom it has fought three wars since 2008. Critics say it amounts to collective punishment of the impoverished coastal enclave's two million residents.